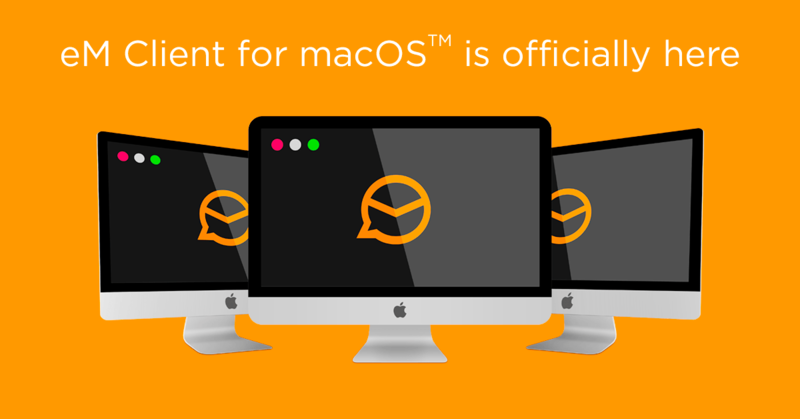 eM Client for Mac is officially here! We're proud to announce, that after years of development we have made the huge leap forward and are ready to announce the full version of eM Client for macOS. From January 24, 2019 you can use all the features you've grown accustomed to on both Windows and Mac. It was quite a big challenge which is why the release took a little longer than initially planned. We tried to make up for it with thorough testing and debugging, so the Mac version is now faster and looks much better than the first Beta version. We also started working on eM Client 8 which will improve on the design and functionality on both platforms. eM Client for Mac is fully integrated into the operating system, just like the Windows version. As opposed to web email clients, eM Client will make your work easier and more efficient with keyboard shortcuts, system notifications, automatic backup, drag-and-drop support, and other features connected to the Mac system. We also implemented import from native Calendar, Mail and Contacts apps and import from Thunderbird. By doing so, we strive to contribute to your productivity and to make it easier to switch to eM Client in Mac environment. The great benefit of eM Client is the support of a large number of features within a single (and easy to use) application and broad support for services that can synchronize your data. Such a wide range of functionality is unique in the macOS environment and we believe that eM Client will soon find plenty of satisfied users from individuals and companies on this platform. So what's left to bring us to perfection? This is our very first official version for macOS, which is why there is still a place for improvement and few things are lacking compared to the Windows version. Our team keeps working hard on them and they should pop up in the upcoming updates. Currently, there is still a lack of support for S/MIME certificates, Exchange accounts that only use NTLM authentication or Single sign-on.